Trump Taunts Kim: My 'Nuclear Button' Is 'Much Bigger' Than Yours : The Two-Way In the latest tweet to ratchet up tensions with Pyongyang, the president responded to the North Korean leader's New Year's address, in which he warned that his missiles could reach all of the U.S. In another tweet, President Trump again referred to North Korean leader Kim Jong Un as "Rocket man" and implied that U.S.-led sanctions against Pyongyang had caused the regime to open dialogue with Seoul. President Trump and North Korean leader Kim Jong Un are once again publicly comparing the size of their respective nuclear arsenals, with the president tweeting that the U.S. "nuclear button" is "much bigger & more powerful" than the one controlled by Pyongyang. Trump's comment on Twitter comes in response to Kim's New Year's address in which the Korean leader warned that the entire "U.S. mainland" is "within the range of our nuclear strike." Mocking Kim, the president wrote: "Will someone from his depleted and food starved regime please inform him that I too have a Nuclear Button, but it is a much bigger & more powerful one than his, and my Button works!" 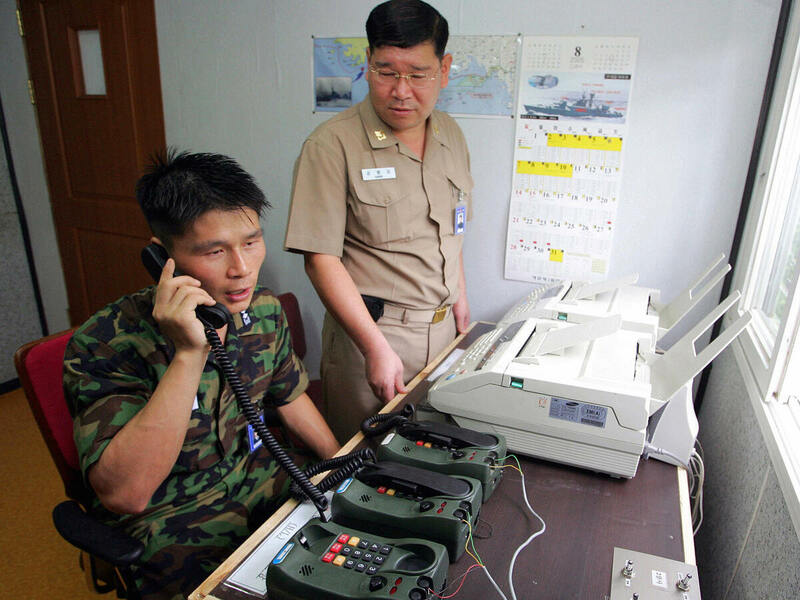 South Korean Lt. Choi Don-rim (left) communicates via a hotline with a North Korean officer at a military office near the Demilitarized Zone in 2005. Pyongyang has announced that it would re-establish a long-closed border hotline. The remark comes on the same day that Pyongyang announced it would re-establish a long-closed border hotline. On Wednesday, South Korea said it had already established "preliminary contact" over the line at the truce village of Panmunjom. In response, Seoul offered Jan. 9 talks with the North to discuss cooperation at the Winter Olympics next month in Pyeongchang, South Korea. Pyongyang has yet to respond. NPR's Rob Schmitz reports that "South Korean officials are calling the announcement a very significant step," but he cautions that "there have been repeated attempts in recent years by the rivals to talk, and even when they do meet, the efforts often end in stalemate." Earlier Tuesday, the president again referred to Kim as "Rocket man" and implied that U.S.-led sanctions against Pyongyang had caused the North Korean regime to open dialogue with Seoul. However, U.S. Ambassador to the United Nations Nikki Haley, speaking to reporters, appeared to pour cold water on the prospect of substantive change in relations on the Korean Peninsula. What North Korea's Call For Direct Talks With South Korea Could Mean For The U.S.
"We won't take any of the talks seriously if they don't do something to ban all nuclear weapons in North Korea," Haley said at the United Nations. "We consider this to be a very reckless regime. We don't think we need a Band-Aid, and we don't think we need to smile and take a picture." Since the start of the new year, Trump has tweeted at least 19 times, lashing out not only at North Korea, but also at Pakistan, Iran, and the Palestinians, in addition to "Crooked Hillary Clinton," Democratic lawmakers in Congress and "the Fake News Media."